Read novel publications prepared with utilization of our PASS CLC Pred web-service (Maiti P. et al., 2016; Nand M. et al., 2016; Thomas A. et al., 2016). Tarasova O.A. How to increase the concordance of the experimental data for QSAR modeling: case study for HIV-1 reverse transcriptase inhibitors – Oral talk. (Abstract). Druzhilovskiy D.S. Way2Drug – revealing hidden potential in traditional indian medicine ayurveda – Poster. (Abstract). Filimonov D.A. Comprehensive assessment of the toxicity of xenobiotics taking into account their metabolism in the human organism – Poster. (Abstract). Pogodin P.V. PASS Targets: a new web-service for prediction of interactions between the drug-like compounds and human protein targets – Poster. (Abstract). Rudik A.V. Web service for predicting structure and toxicity of xenobiotics’ metabolites – Poster. (Abstract). Tarasova O.A. Integrated ligand and structure based approach to the search of the HIV-1 reverse transcriptase inhibitors – Poster. (Abstract). Ivanov S.M. Identification of proteins associated with drug-induced liver injury using in silico prediction of drug-target interactions. – Oral talk. (Abstract). Karasev D.A. Based on the local sequence similarity method for prediction of amino acid positions related to the protein-ligand specificity. – Poster. (Abstract). Poroikov V.V. Computer-aided drug repurposing: new uses for old drugs or filling gaps in biomedical knowledge. – Oral talk. (Abstract). Tarasova O.A. Fighting with HIV-1 resistance to reverse transcriptase inhibitors by computer-aided approach. – Poster. (Abstract). Dmitriev A.V. Prediction of reaction position for first and second phase xenobiotics metabolism. – Oral talk. (Abstract in Russian). Filimonov D.A. PASS affinities or is naive method of obtaining «naive bayes» (Q)SAR estimates. – Oral talk. (Abstract in Russian). 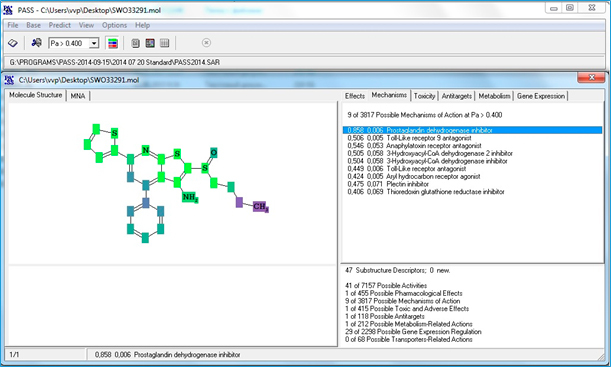 Lagunin A.A. QSAR modeling and prediction drud-drug interaction – Oral talk. (Abstract in Russian). Karasev D.A. Determination of amino acid residues that influence selectivity to the human protein kinase inhibitors. – Oral talk. (Abstract in Russian). Konova V.I. Web service for in silico prediction of cytotoxic effect of chemical compounds in non-transformed and cancer human cell lines. - Oral talk. (Abstract in Russian). A newly identified small molecule increases the rate of tissue regeneration in the colon, liver, and bone marrow of mice. With further testing and development, such a compound could lead to therapies that would help patients heal tissues damaged by disease or excised through surgery. The new strategy boosts levels of PGE2 through another mechanism: by inhibiting an enzyme that breaks it down. The approach was devised by Sanford D. Markowitz and Stanton L. Gerson of Case Western Reserve University; Joseph M. Ready, Bruce Posner, and James K. V. Willson of the University of Texas Southwestern Medical Center, Dallas; and coworkers (Science 2015, DOI: 10.1126/science.aaa2340). The team used high-throughput screening to find SW033291 , a small molecule that inhibits a key prostaglandin-degrading enzyme, 15-hydroxyprostaglandin dehydrogenase. Administering the agent to mice doubled levels of PGE2 in their bodies, doubled rates of tissue regeneration in their colons and livers, and made bone marrow reconstitution faster. The researchers next plan to test an easier-to-administer version of the molecule for toxicity in animals and, if that compound appears safe, they hope to apply to the Food & Drug Administration to start testing it in people, Markowitz says. Pa is the probability to be "active, Pi is the probability to be "inactive". In addition to the known target (Prostaglandin dehydrogenase inhibitor), interaction with some other targets is predicted for this compound as well, including: 3-Hydroxyacyl-CoA dehydrogenase inhibitor, Toll-Like receptor antagonist, Aryl hydrocarbon receptor agonist, etc. Despite the less probabilities of these activities, such interactions have to be checked experimentally, because e.g. agonism to aryl hydrocarbon receptor may be considered as action that causes off-target effects. References: (Link 1), (Link 2). Analysis of pharmacological potential of natural compounds on the basis of chemo- and bioinformatics – Poster at the Exhibition (in Russian). Pogodin P.V. Clusterization of human protein kinases based on selectivity of sub-micromolar inhibitors – Oral talk. (Abstract). Karasev D.A. Prediction of the inhibitor specificity to protein kinases based on the amino acid sequences – Poster. (Abstract).